Captain Dan Simco gave the benediction. The ceremony featured members of the Honor Guard, and the National Anthem was performed by the Portsmouth West Marching Band. 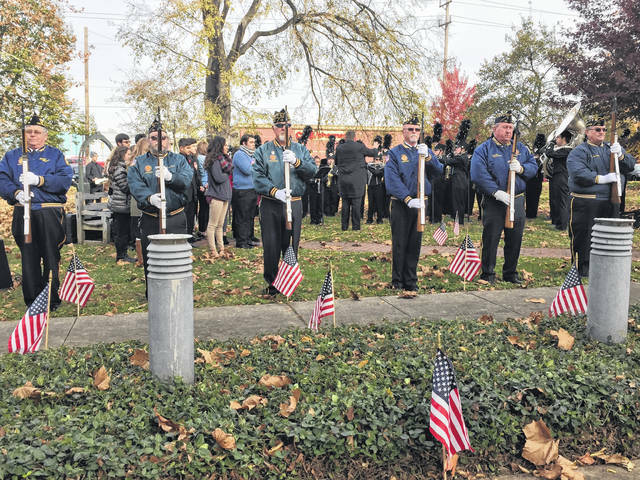 On Saturday, Nov. 11th, the Scioto County Veterans Service Commissioners held their annual Veteran’s Day Ceremony. 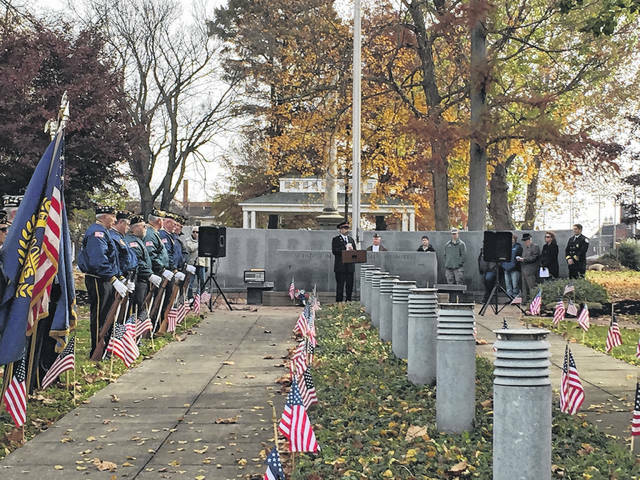 The ceremony was held in Tracy Park and began at 10:30 a.m. on the holiday. Sam McKibbin served as the Master of Ceremonies, and the National Anthem was performed by the Portsmouth West Marching Band. The invocation was given by Captain Dan Simco, and the raising of colors was carried out by Caden Lowery and Owen Dennewitz. The Portsmouth West Vocal Choir performed several songs, alongside a second performance by the Portsmouth West Marching Band. Welcome and Recognizing of veterans organizations was given by McKibbin, and guest speaker, Portsmouth Assistant Fire Chief Chris Lowery gave his speech, centered around utilizing the wealth of knowledge and experiences these Veterans hold and stressing the importance of thanking those who have proudly served. Closing remarks were given by McKibbin, following the Honor Guard, and “Taps” was performed by two members of the Portsmouth West High School band. The benediction was given by Captain Dan Simco, following a touching personal account of his own thankfulness for those brave Veterans who have sacrificed their lives. “This is our annual ceremony and it’s an honor for our office to hold it every year to honor our brave veterans,” said Kimberly Dennewitz. Following the ceremony, a free bean dinner was served at the American Legion Post 23 for veterans. The ceremony would not have been possible without the participation of the organizations from the following areas: American Legion Post 23, American Legion Post 363, American Legion Post 471, American Legion Post 622, Amvets Post 2352, DAV Chapter 10, DAV Chapter 134, Ex-POW’s Post 11, CPL Tim Bauer detach #720, Marine Corps League, Military Order of the Purple Heart Ch. 672, and VFW Post 3638.